This release includes JIRA 6.0, a new look and feel in GreenHopper, and improvements in Confluence and Bitbucket. We've been progressively upgrading JIRA OnDemand with JIRA 6.0 features over the last few months. The features you've been using have been collected into a major release and will be announced to on-premises customers next week. Enjoy this video about all the features that have been collected into 6.0! 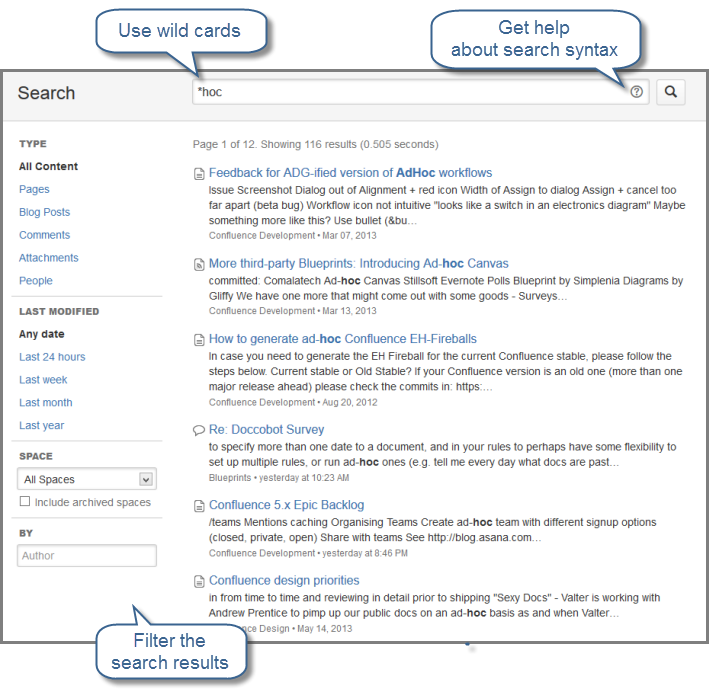 The new left-hand panel makes it easier to define your search filters and to see which filters are in effect. Choose the question mark on the right-hand side of the search box for help with search syntax. If you enter more than one search term, Confluence will give a higher ranking to results where the terms appear close to each other in the matching content. You can now enter a wildcard character at the start of a word, as well as elsewhere in the word. For example: Enter '*hoc' to find all content that ends with 'hoc'. 'Did you mean': We have removed the functionality that offered alternative search terms, such as correcting a spelling mistake. This functionality, known as 'did you mean', slowed down the search considerably. Labels browser: We have removed the panel that displayed related labels on the search results page. This release includes improvements for a couple of Confluence macros. We're also releasing minor bug fixes for JIRA, FishEye, Crucible and Bamboo. The Create From Template macro allows you to add a button to any page to create a new page from a template or blueprint. You can now specify a default page title for all pages created using the button and even include variables such as the current date, space name or space key in the title. See the documentation. Tempo has been upgraded to 7.5.4.1. See Tempo 7.5.4.1 Changelog for more information.